Date of birth Aug 17, 1969 Boston, Suffolk County, Massachusetts, U.S.A.
Donald Edmond "Donnie" Wahlberg Jr. (born August 17, 1969) is an American singer-songwriter, actor, record producer, and film producer. He is a founding member of the boy band New Kids on the Block. Outside of music, he has had roles in the Saw films, The Sixth Sense, Dreamcatcher, and Righteous Kill, also appearing in the World War II miniseries Band of Brothers. From 2002 to 2003, he starred in the crime drama Boomtown. He has been starring in the drama series Blue Bloods with Tom Selleck and Bridget Moynahan since 2010, and since 2014 is an executive producer of the TNT reality television show Boston's Finest. He was nominated for Choice Scream at the 2008 Teen Choice Awards for his work in the Saw films. Wahlberg was born in the Dorchester neighborhood of Boston. He is the eighth of nine children, with older siblings, Arthur, Jim, Paul, Robert, Tracey, Michelle, and Debbie (died in 2003), and younger brother, Mark, who began his entertainment career in the former rap group Marky Mark and the Funky Bunch. He also has three half-siblings from his father's first marriage: Donna, Scott, and Buddy. His mother, Alma Elaine (née Donnelly), was a bank clerk and nurse's aide, and his father, Donald Edmond Wahlberg, Sr. (May 8, 1930 – February 14, 2008), was a teamster who worked as a delivery driver; they divorced in 1982. His father was of Swedish and Irish descent, and his mother is of Irish, English, and French-Canadian ancestry. Maternally, he is distantly related to author Nathaniel Hawthorne. 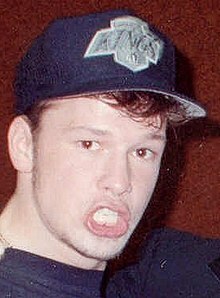 As a recording artist, Wahlberg is known as an original member of the boy band New Kids on the Block. Wahlberg's first film acting role was in the 1996 film Bullet with Mickey Rourke and Tupac Shakur. Also in 1996, he appeared as a kidnapper in Ransom with Mel Gibson. He went back to his home town for a starring role in the South Boston-based film Southie. Wahlberg received attention for his role in the 1999 film The Sixth Sense, playing the patient of Bruce Willis's character in the opening sequence. 2003 was the year that Wahlberg starred alongside Timothy Olyphant, Jason Lee, and his Band of Brothers co-star Damian Lewis as the mentally challenged Duddits in William Goldman and Lawrence Kasdan's adaptation of the Stephen King alien-invasion thriller, Dreamcatcher. In 2005, he starred as Detective Eric Matthews in the second installment of the Saw series. He reprised the role in Saw III in 2006 and Saw IV in 2007, also appearing in Saw V in 2008 via archive footage from the previous films. In 2008, Wahlberg appeared in Righteous Kill. He also co-starred in What Doesn't Kill You. He also appeared in the 2011 comedy Zookeeper. Wahlberg stars as 1st Grade Detective Danny Reagan on CBS's Blue Bloods, a police drama set in New York City. As of 2011, Wahlberg is the host of an internet radio show on Friday nights at 8 pm PST called "DDUB's R&B Back Rub" on Cherry Tree Radio. Wahlberg married Kim Fey on August 20, 1999. They filed for divorce on August 13, 2008, citing "irreconcilable differences". They have two sons, Xavier Alexander Wahlberg (born March 4, 1993) and Elijah Hendrix Wahlberg (born August 20, 2001). In July 2013, it was reported by UsWeekly that he was dating actress and comedian Jenny McCarthy after meeting on Watch What Happens Live in March. They announced their engagement on The View on April 16, 2014. They wed on August 31, 2014, at the Hotel Baker in St. Charles, Illinois. Wahlberg is a passionate fan of the Boston Celtics and has been seen attending many of their games. He narrated a documentary called "The Association: Boston Celtics" about the team's 2010–11 season, which aired on ESPN between 2010 and 2011. He also owns a restaurant in Boston named Wahlburgers with brothers Paul (the restaurant's head chef) and Mark. In February 2016, Wahlberg endorsed Marco Rubio for President of the United States. Cast of TV series Blue Bloods at the 2010 Summer Session of the Television Critics Association. 2000 The Practice Patrick Rooney Episode: "Settling"
2001 UC: Undercover Bobby Episode: "City on Fire"
2010 In Plain Sight Jimmy McCabe / Jimmy Porter Episode: "Father Goes West"
What's the good word on Donnie Wahlberg?